In honor of St. Valentine's Day, here is Planetary: Venus — the anthology edited by A. M. Freeman and myself. This volume also contains a short story written by me that takes place in the Prospero's Children background and features Miranda and Astreus on their Honeymoon! Just Look, I’ll Be There, by A. M. Freeman —A Gypsy boy leaves Venus for the stars, but his beloved’s eyes shine brightest of all. Morning And Evening Star, by David Hallquist — A honeymoon among the sulfurous fumes of Venus takes an unexpected turn. 90 Seconds, by Bokerah Brumley — Online video blogger heads to Venus for the ultimate extreme sports, and jumps into something more than just the sky. The Wrong Venus, by Lou Antonelli — The worst criminals are sent to a high security prison on Venus, but an intrepid criminal might get himself sent to a different Venus. Enemy Beloved, by Monalisa Foster — Love is blind. But what will happen when the blindness ends and the terrible truth is reveled? Texente Tela Veneris, by Edward Willett — If you could change the history of your love life, would you? That is the question a pair of tourists on a remote Grecian island must answer. Happiest Place On Earth, by Misha Burnett — A story of pure love in an unexpected place. Love Boat To Venus, by Declan Finn — On a tour around the solar system, elite fighters pause to give marital advice, until they are interrupted. 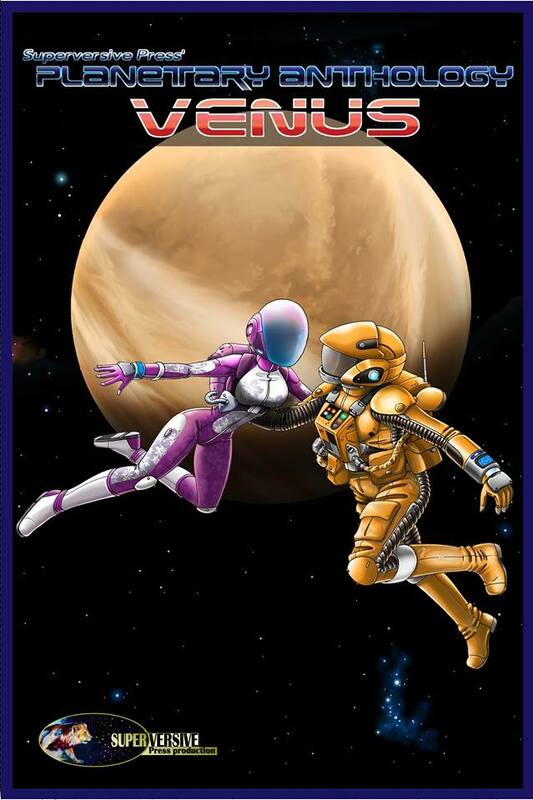 Venus Times Three, by Vanessa L Landry — Two lawyers travel to Mars to settle a will that, inexplicably, involves Venus. Will they be able to untangle this complicated web? Avalon, by Dawn Witzke – A new school on Venus brings new opportunities for a young man to escape the shadow of his childhood friend. The Rituals Of Venus, by Joshua M. Young — A hero fights cultists among the jungles of Venus for the sake of his love. Can he save her? First Cat In Space, by Dana Bell — Some cat has to be lucky enough to be the first cat in space. Venus Felix, by W. J. Hayes — A routine day at the bar turns into anything but for this gumshoe, when robots begin shooting at a newcomer. The Rocket Raising, by Frederic Himebaugh — A young girl must choose between marrying her love and venturing to a new world for the sake of her people. Star-Crossed, by Julie Frost — A werewolf detective helps an unlikely client in her revenge after her lover is murdered, but old memories aren’t the only thing that comes back. Honeymoon In Fairland, by L. Jagi Lamplighter — Can love and trust be rekindled between a betrayed husband and his wife? Even when they are as powerful as Gods? 37 Shades of Yellow, by J.D. Beckwith — The new Venus base is up and running, but what does it take to live there when your wife is homesick for Earth? The Fox’s Fire, by Danielle Ackley-McPhail — A spirited fox spirit seeks love in ancient America. Smiley The Robot, by Amy Sterling Casil — An old woman living alone on Venus finds herself falling for Smiley, the police robot. Stones In High Places, by Jane Lebak — A dying world watches with anguish as a young one awaits its demise, until one man conceives of a way to save them, but it will take an act of unprecedented love.